Pee Gee Hydrangea is a fast growing white flowering shrub noted for its large splash of white when very few plants are in flower. This white hydrangea boasts 6 to 8 inch long white blooms that are 3 to 4 inches wide at the base. Excellent for a wide flowering hedge or specimen white hydrangea. 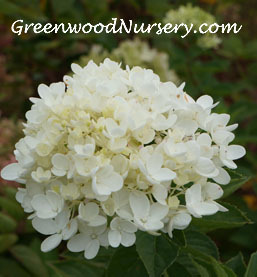 The PeeGee Hydrangea Shrub displays moderate water requirements and a moderate tolerance to salt and alkali soils. The pee gee hydrangea is one of the few hydrangeas that grows in full sun.